"You know the world is made for men, Not us"
Sorry, no matches on eBay for "What Am I Here For? 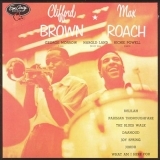 Clifford Brown And Max Roach". Your feedback for What Am I Here For?